Art By Isherwood regrets to record the death of the artist’s former wife, Florence. She passed away at 10-15 on Monday October 7 at the Great Western Hospital, in Swindon, after a short illness. She was in her 90th year. Florence Bankes married J Lawrence Isherwood at Wigan Parish Church in a “society” wedding just before the end of the second world war. On the same day, her sister Molly married the artist’s brother Gordon. The double wedding attracted a large crowd of well-wishers. 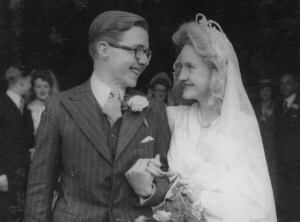 The marriage between Jim and Florence did not work out and after some years, she sought a new life in the beautiful village of Shrivenham in Witshire. Molly Isherwood said: “Florence was a unique lady who truly looked on the very brightest side of life. “She has had a very full life and found great happiness in Shrivenham. Her husband Geoffrey died earlier this year. Geoffrey Shryhane writes: I have never met a lady as remarkable as Florence. She came to one of the exhibitions at Wigan Town Hall, making the journey and return in one day. Her enthusiasm was enormous. “She has an enormous zest for life. I saw her seven weeks ago and although not feeling well, she wanted to know all the news.